Our shade loving plants list was inspired by the woodland glade at Cobble Hey Farm and Garden in Lancashire. All of the following plants thrive well under the dappled shade of trees in an area elevated 600 feet above sea level; We have put together a list of suppliers and specialist nurseries where these plants can be sourced online. Aliums – A member of the onion family, aliums give height and structure to any border. Helebores – Bring early colour to the garden in many shades of pink, green and cream, through to deep velvet purples. Snowdrops – All varieties of Galanthus thrive well in dappled shade. Astrantia – These shrubby plants give height and structure with papery flowers ranging from white to deep rugby. Brunnera – With flowers like those of forget-me-not in blue and white, brunnera give great ground cover and some have attractive silvered foliage. Epimedium – Delicate nodding flowers in shades of lemon and pink appear early in the spring above heart shaped leaves. A great ground cover plant for shade. Geranium – Perennial geranium originate from the wild cranesbil and produce mounds of medium height growth and masses of flowers in a range of colours. Hosta – A stunning array of architectural foliage plants in more shades of green than you can care to imagine. Often produce tall spires of white, pink or lilac flowers in summer. Trolius – Looking like a huge buttercup with incurved double petals, this regal flower gives a little bit of height and a dash of bright colour. Corydalis – Corydalis are at home in moist shade and the delicate nodding flowers bring grace and colour to the border. Grasses – Many grasses are capable of thriving in dappled shade. Aquilegia – Columbines may be small alpines or 3 foot tall specimens. Commonly known as granny’s bonnets, their colour range is vast with gently lobed, fern like foliage. 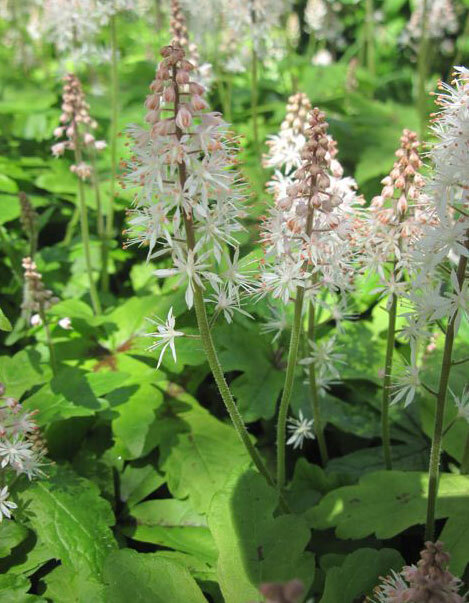 Tiarella – Very similar to heuchera’s in their ground covering habit with a wide range of foliage colours. However, their spikes of flowers are more substantial and often fragrant. Pulmonaria – Lungwort spreads easily giving good ground cover. The leaves are often mottled with silver markings and the bees love their white, pink and purple flowers. Heuchera – A very popular plant in the herbaceous border, the ground covering foliage is available in a vast range of colours, from acid greens, through to purples and terracotta. Acers – Very slow growing trees native to the orient without which no Japanese garden is complete. Their graceful arching branches of delicate foliage give structure and colour. Ferns – Large or small, ferns can provide ground cover or give structure to a woodland planting scheme. Ranunculus Flore Pleno – Often referred to as ‘Fair Maids of France’. This graceful plant carries bouquets of small, perfectly formed double-white buttercups, with green centres on widely branched stems. Don’t forget bulbs…apart from corydalis, anemone, aconites and cyclamen are wonderful woodland plants and many other low growing perennials, such as violets and primulas will add splashes of colour. Avon Bulbs – Bulbs for shade – a selection including corydalis. Pottertons – A great range of plants for partial and full shade. Plant for Shade -A wide range of heucheras, tiarellas and other plants for shady areas.